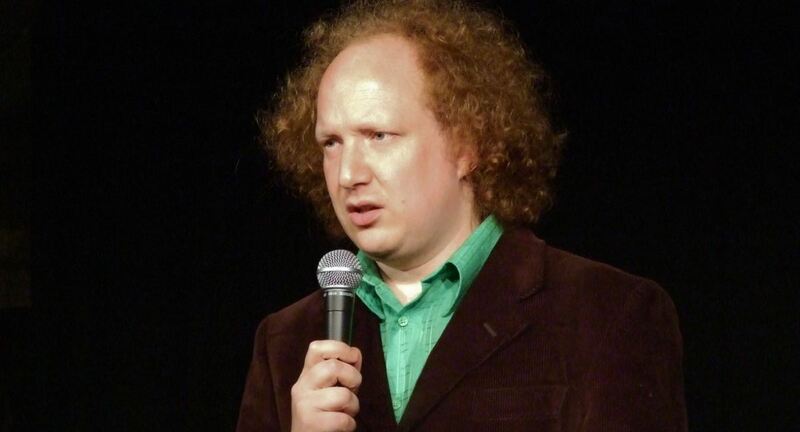 Seasoned stand-up, sport & political writer, and one half of The Bugle Podcast, Andy Zaltzman has built a show around audience suggestions, and approaches each one through the sharp lens of satire. He has been taking requests over Twitter and email for the past few weeks, and just in case there are any last-minute ideas from tonight’s audience Zaltzman stands with a clipboard taking notes as the audience file in. Introducing himself from an overly-lit corner of the room, Zaltzman’s is probably the longest offstage buildup at the Fringe. Fans of The Bugle will recognise his style from the rambling “facts” at the start of each show, and the Satirist For Hire format stays true to form. Zaltzman has an office space set up on stage, lending an air of forethought, organisation, and gravity to Zaltzman’s satire. The first target on tonight satirical agenda is the NHS, requested by a man with a broken leg in the audience – an injury sustained during a cycling accident, which allows Zaltzman to slip into routines around Lance Armstrong for some heavy early laughs. He then dutifully takes down the NHS, in what is clearly a mix of pre-written routines and deft improvisation to link them together. Zaltzman introduces his cactus-themed radio device, which he explains is set to pick up any incoming news stories that need instantly satirising, but in reality provides a distraction while he hastily makes notes on the issues he’s about to tackle. He clearly has a vast rolodex of routines available, from his 15-year history at the Fringe and beyond. Obviously a lot of his material is based on current world events, but his ability to shape comedic ideas around a single suggestion is an incredible thing to behold. Unlike many improvisation-based shows at The Fringe, Satirist For Hire blurs the lines between pre-written and improvised material, and its open-ended format could be disastrous for a lesser comedian. Luckily, Zaltzman is adept at choosing the right material, and at skipping quickly over material that hasn’t worked as well as he’d hoped. As Zaltzman readily admits, the timing of the show isn’t quite right, and consequently the concepts satirised at the beginning of the hour receive more attention than those at the end, leaving a slight rush to wrap things up on time. Nevertheless, Satirist For Hire is a brilliant hour of derisive comedy from one of the sharpest wits on the circuit.